I’ve mentioned previously that I’m not a videogame person. Handheld, console, MMO, they’re really just not my thing. 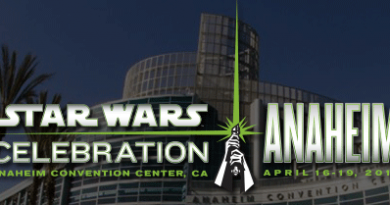 Ever since I attended Bioware’s panel on Star Wars: The Old Republic at San Diego Comic-Con last July, though, I’ve been intrigued enough to keep paying attention to the news about the game. With as busy as I am – finishing Wynde, competing with Ganner the Jedi Horse in our winter hunter circuit season, and blogging at FANgirl and Suvudu – I can’t imagine I’d have the time to play TOR, especially facing the learning curve of a noobie. But I’m about as tempted as I’ve ever been to give a game like this a try, and I know there are other Star Wars fans out there who are in the same boat. So I asked Racheal Ambrose, who wrote a guest blog a few months back about gaming and who’s been blogging updates on her experiences playing TOR, to help me write an introduction to the basics of the game for noobies like me – essentially I ask the questions and Racheal gives the answer. If you’re thinking about trying TOR but are daunted by it, I hope this is helpful for you. So here I am – new to gaming. What do I need to start playing The Old Republic? In addition to the game itself, you’ll need an internet connection and a decent computer, and speakers or a headset. For those who don’t have that option for whatever reason, closed captions are available. When you buy the game, you’ll find a game code inside; or if you bought digitally, check your email. Do not lose this code. Without it, you can’t play. End of story. Next, figure out what role you want your first character to take: healing, tanking, or damage per second (DPS). Healing classes use various abilities to restore health. Tanks hold the threat and try to take most of the damage. Tanks tend to live longer, but don’t do as much damage. DPS is in charge of doing as much damage as possible in a fight. DPS does more damage, but has less survivability. Not all classes can do all three roles; for example, Jedi Knights cannot heal. 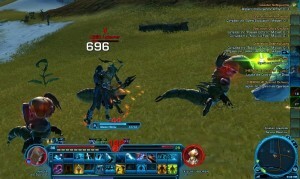 Within the DPS options are various forms of combat. These roles are vital in a group and dictate what companion is the most useful to use. If you are a healer, running around with a healer companion isn’t exactly helpful. Until you gain multiple companions, though, you may not have a choice. How long will it take me to get set up and playing? Any tips to ease the process along? Download the game as soon as you can. Due to its size, it takes a couple of hours. The amount of time depends on internet speed. Fortunately, you don’t need to put in the code to download it. If you planned to buy the game, for instance, install it first to save playing time. The best thing to do is let it download during the night. The download process slows down the speed considerably on some computers. After the download is complete, install it. 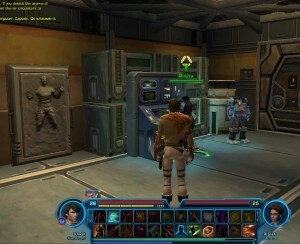 Once the game is ready to go, log onto SWTOR.com. Either log into an existing account or create one. The username is your handle on the forums. After creating the account, go into the management menu to input the code. This takes a few minutes. Later on, you’ll need to set up subscription options; you don’t have to do this to log into the game, but you can do it at the start if you want. For many games you can just turn it on and play for 15-30 minutes, have some fun, and go do something else. I get the impression most MMOs (and some of the RPGs that aren’t MMOs, like Halo or Mass Effect) aren’t really like that. Is there a minimum time period you suggest to set aside for each time I sit down to play? Or a minimum hours per week needed to make the experience worthwhile? There are some things you can do in a short amount of time, but full-out questing takes longer. Around level 16 – or end of the class story on Coruscant (Republic) or Dromund Kaas (Empire) – you’ll receive a personal ship. This gives you access to daily space missions that you pick up in the cockpit. The space missions only take a few minutes and grant a good amount of experience points, so they are great for quick play sessions. Another option for short play sessions is PVP (Player Versus Player) combat. All characters can join in after hitting level 10. The matches take anywhere from five to fifteen minutes, depending on which one the character is randomly placed into and the team’s ability. The amount of time it takes to complete a group of quests depends on level and world. The starting world quests are close together and easy to knock out in a couple hours. Other places, like Coruscant and Nar Shaddaa, clump the quests in “sectors.” You could go to one area, like the Red Light Sector on Nar Shaddaa, for an hour or two and complete those quests. Places like Alderaan and Tatooine are more spread out. The amount of time needed per week depends on the person. I consider playing for a little while at least four days a week worth my time. Others feel they need to log on every day. I’d recommend at least eight hours a week. You can do little things like logging out in a cantina where the next quest area is or flying the ship to the right planet before a play session to save a couple of minutes. Players start out the game at level one. In order to increase to the next level, you must earn experience points (xp). 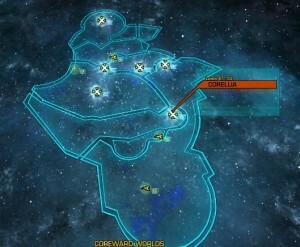 The points come from completing quests, killing enemies, space combat, and PVP warzones. The amount of points needed increases with each level. Once you reach level 10, you then start to earn one talent point per level. These talent points go into your talent tree. Each talent tree contains three options in your advanced class. The tree you go with depends on what you want to do. For example, if you wanted to heal as a Jedi Consular, then you would select the healing options in the talent tree. Health and other stats also increase with level. The companion is the same level you are, no matter if you bring it out often or not. Each enemy you fight has a level. If something is higher level than you, then it is more difficult to eradicate than something at a lower level. Can I play alone or do I have to know people to play with? Yes, you can play alone. In each zone, there are Heroic quests that require multiple players. These aren’t required to do. Actually, the only quests you “need” to do are the class story. The rest immerse you in the planet’s story and make it possible to level at a good rate. You can find people to help with these using the general chat. 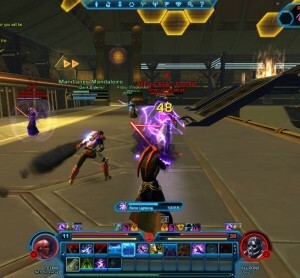 In addition to the Heroics, players who wish to do flashpoints or raids need to find other players in the game. Again, using the general chat is a good way to do this. Joining a guild also helps. A guild is a group of players who can talk to each other via the guild chat and help each other out, to put it simply. There’s no guild bank yet, so any item trading is done via word of mouth. You don’t have to know anyone personally. If you don’t want to play with others, there are plenty of quests to do on your own. Most of the game is playable solo. What is the objective of the game? And how do you recommend making the most of that experience? Right now, I’d say the objective is to hit level 50 and know the character play style well. MMOs don’t have a real “ending.” You’ll complete the class story and then you can do raiding, flashpoints, PVP, whatever you want to do with your character. Given that the game is new, it’s not as if you can go back and do the old raids for fun. BioWare will release patches that include end-game content. I haven’t hit level 50 yet, so I haven’t seen much of that. The best way to make the most out of the game is to do what you enjoy doing. If you hate flashpoints, don’t do them. Letting others influence you to blast through levels or participate in activities you don’t enjoy will kill the game. What are some of the cool things you’ve been able to do so far in the game, or that you’ve acquired? How difficult do you think it will be for a noobie to reach some of these cool things? 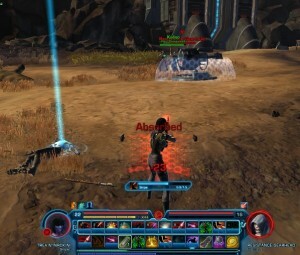 Fighting a full Sith in the ruins of the Jedi Temple during the Jedi Knight story quests was one of the coolest things I’ve done. It felt like Star Wars. The game throws players into these situations that capture the essence of the movies. The Imperial Agent story line is so good. It’s like being in a spy movie. As for items? I had an orange lightsaber for a while. Not many people had one of those. It came from the Athiss flashpoint. Anyone can find neat stuff in the game. However, for everything cool thing you find, there’s something ridiculous out there. My Smuggler currently has on a chest piece that has a scarf around the shoulders with gold medallions. I’m not sure what look is going on with that. 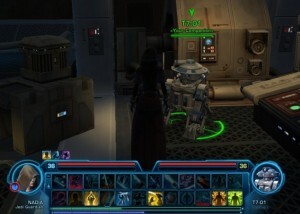 Probably my favorite thing I’ve been granted is T7, the Jedi Knight companion droid. All Jedi Knights will have T7 by the time they level their starting world Tython. T7 is Artoo and WALL-E wrapped into one. He was also in Paul Kemp’s Deceived. He’s funny, adorable, and rather vicious. I’m not sure if it’s the game or my computer, but I’ll see T7 shoot an enemy after it’s dead. Everything I’ve read emphasizes that the story is a big part of TOR. Can you explain how the choices made by a player effect their experience? And how much do other people’s choices affect the outcome of your game, if you’re playing with a group? Almost every quest (usually not drop box ones) have some sort of dialogue and story. Players pick from two to three choices. Most of these don’t grant Light or Dark Side points. Instead, they lead the conversation and can influence what happens next. For example, I had my Smuggler flirt with a woman he was working with. Eventually the two went off together for a while – they walked off with a bottle of alcohol, a black screen appeared, and then they were back. The companion I had with me, Corso, even made an awkward comment about getting lost. That wouldn’t have happened had I selected different options in how to interact with the woman. Anytime the conversation wheel appears, run the mouse over the options. 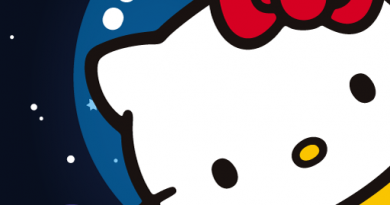 If Light and Dark Side options exist, an icon will show in the center of the wheel (blue is light, red is dark). These options have an impact on the story and the character. The eyes will change colors on the Sith, for example, as more Dark Side levels are earned. The quests stories can stay with one non-player character (NPC) or span several. On Tatooine, various Jawas give you related tasks and recommend you to another Jawa. Without the story giving the players a reason to do what they’re doing, the game isn’t as fun. When I played World of Warcraft, I never read the quests because I simply wasn’t interested in WoW lore. These story lines feel like Star Wars, making them fun to do. When you play as a group, the game does a random roll to see whose selection wins. That one is spoken and followed through. That said, if you pick a Light Side option and the winner picked Dark Side, your character doesn’t suffer from it. In regular conversations, it can be a little amusing to see two vastly different options play one after the other. These options can change what happens next. Take the Esseles flashpoint, for example. Towards the end, you can choose whether to leave the ambassador to die on the Imperial ship or take her with you. Let’s say your Sith picks leave her, thus earning more Dark Side points, but the Bounty Hunter selected the Light Side option to take her and won. You’ll see her leave with your group and the discussion about it on the bridge, but because you chose to leave her, you get the Dark Side points. Ultimately, the other players’ choices won’t affect the game much for your character. It may add or take away time, or you’ll miss a fight, but that’s it. Class stories are a little different in that only you can make the choices. Someone can come in to help you, but she is a spectator. The options selected can change the outcome of the story. For example, a Sith Warrior could opt to free Vette rather than keep her a slave. If he wanted to romance her, he can eventually marry her. This is an alternative to leaving Vette enslaved and torturing her. Occasionally, the class stories mention things from others. For example, my Imperial Agent works with Watcher Two frequently. I ran into Watcher One on my Jedi Knight. It was a neat little link to see. Do you think playing a male or female character changes the experience? Yes and no. It changes the conversation options a bit. For instance, the scenario I mentioned above with my male smuggler wouldn’t happen with that same NPC if I were playing a female. However, a female could flirt with a male. These slight changes in dialogue make the experience a little different. 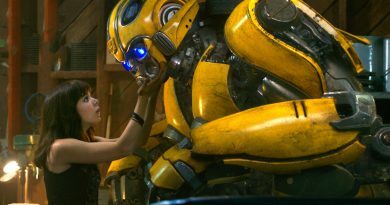 Because the mechanics are the same no matter what gender or species you are, there’s only so much that can change. Probably the biggest experience changer is the actual appearance options of the male and female characters. With the male, you can have a stick thin, scrawny male, muscular, average, or overweight. Female characters aren’t overweight. You can make one bigger, but it’s not like the overweight male. It doesn’t seem right to limit the possibilities or to only allow players to make characters that some consider “attractive.” The variation between male characters is much more defined than the female characters. The other problem with appearance is NPCs, namely children. On Coruscant, there is a quest where you encounter a young boy and girl. The girl is probably around nine or ten, given her demeanor and responses. The boy is around 12 or 13. He looks like a kid. The girl looked like a full-grown woman shrank down. Ten-year-old girls aren’t that developed. It’s awkward and creepy. I’ve never felt like my female characters were actually males with a different skin over them. I think that’s because I get to pick how the characters to react the situations. They’ve all developed a bit of a personality, to me anyway. You’ve blogged about your experience as a gamer. What suggestions do you have for new players so that they don’t step on any Sith Lord or Jedi Master toes when they jump into the MMO fray? Don’t stand in the fire. No, seriously. Enemies, especially bosses, like to spray fire, poisonous circles, and other area of effect (AOE) threats around them. These cause massive damage and are a pain in the rear to heal through. It’s especially annoying for melee DPS players, like Jedi Knights, who need to stand right next to the enemy. Just back up and wait for it to disappear. Do any type of distance attack you can. It won’t last long. No one player in the game knows everything or is good at everything. Even the most experienced players mess up. The best thing for a new player do is to take about five minutes to become familiar with the action bars, options in preferences, character menu, and other parts of the User Interface. There’s a tip box on the right that also helps. Ultimately, as long as you respect other players, you shouldn’t face many problems. There will always been the inconsiderate, rude people in the game, but fortunately they are easy to ignore. Amen to not standing in the fire! I’ve heard lots of good things about the story in ToR. Keeps temping me to play myself.